'A cross between Twenty Four Hour Party people and Tom Perrotta's The Leftovers, written by Julian Barnes. It contains a narrative as spiky as a punk set, a whole symphony of ideas composed by Mankowski within a few subtle bars of text. 'This book is the epitome of cool. A brilliantly written literary treat.' AJ Kirby, reviewer for The New York Journal of Books. ‘Anyone who remembers Melody Maker, or who attended indie nights in clubs strewn with Snakebite, will fall in love with this book immediately. Mankowski captures brilliantly the psychology of ‘fan obsession’. Those of us who marvelled at ‘The Secret History’ or ‘A Passage To India’ are sure to find it enthralling.’ Matthew Phillips, Huffington Post. ‘Already recognised as a major rising talent, Mankowski here establishes himself as a significant voice in British fiction. 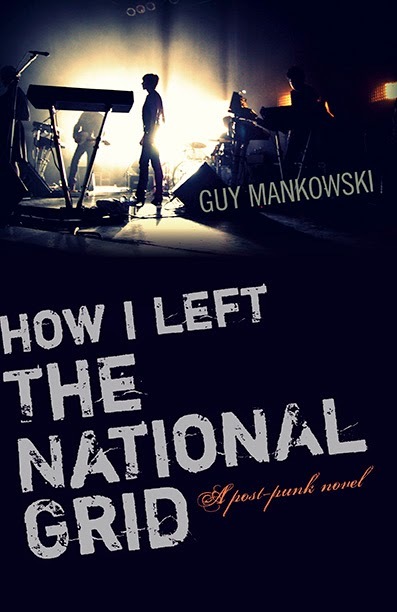 'How I Left The National Grid' is a compelling story of youthful rebellion and midlife angst, as a music journalist tries to track down the legendary band that launched his career. His search for the elusive artists and their legacy is a journey through time and place, from the Manchester post-punk scene to the hip media world of contemporary London. This novel will raise knowing smiles from the rock cognoscenti, plaudits from literary critics, and will captivate readers everywhere.' Andrew Crumey, author of Pfitz, longlisted for the Man Booker Prize. ‘There is so much about this novel that people would enjoy. It's funny too- at times I laughed out loud. With the character of singer Robert Wardner I felt he was channelling Mark E Smith, Ian Curtis and Richey Edwards simultaneously. Very powerful.’ Lyn Lockwood, Chief Examiner for A Level Creative Writing (AQA).